Poster Night is a fun and rewarding experience for first-time presenters and experienced practitioners alike. Posters are a low barrier-to-entry way to present your work and ideas at a major international conference. You’ll get to know the community and share your insights with people who are interested in your topic, all while in a relaxed and engaging setting. See what past poster presenters say about Poster Night! When is Poster Night? What do I do as a presenter? On Poster Night you’ll present your poster on site at the IAC in Orlando on Friday March 15th from 6 to 8 PM. You’ll stand and present to anyone who passes by your space and shows interest. Am I eligible for a conference discount? If you present a poster, we’ll give you a discount code for conference registration. How complete does my poster need to be before I submit a proposal? You don’t need a finished poster to submit. All you need is a concept. If your idea is accepted, you’ll need to send a draft of your poster for review by March 1, 2019. I’ve never presented a poster before. How should I prepare? If your poster is accepted, we’ll send you a how-to packet on preparing your poster and presentation. What is the format for poster presentations? How big can my poster be? Each presenter gets an exhibit space in the presentation hall. The area for your poster will be roughly 4 ft wide x 4 ft tall. There will also be room in front of the poster for a table or other furniture if you need it. Exhibits should include a graphic poster describing an idea, technique, case study, or research. But you could also use your exhibit to showcase a 3D model, engage interactively with attendees, host a puppet show, or lead interpretive dances about information architecture. Your imagination and the space are about the only limits. What if I need a power outlet or furniture? If your presentation requires access to a power outlet or a table, chair, or stools, let us know in the submittal form. We’ll factor in furniture and wall power requirements when we map the exhibit space. What if I need other technology? If you’re planning to do demos, use a robot, or display other tech, you are responsible for bringing all technology and materials with you — monitors, projectors, laptops, extension cords, arts and crafts materials, all of it. What if I need a chair or have other accessibility needs? Please let us know in the submittal form. We are more than happy to accommodate your request. When do I set up my poster? Presenters will set up their own work on Friday, March 15 during the day. Will I be listed on the website? Yes! A list of all poster presenters will be on the website, so you can announce your participation on all your social channels. We also archive all the posters. How long is Poster Night? Poster Night runs from 6:00-8:00 PM. Please plan to stay the whole time. There are usually two waves of viewers: the before-dinner crowd and the-returning-from-dinner crowd. Since you’ll be in front of your poster for the night, plan to ask someone to bring you food and drinks. Bathroom breaks are welcome! Presenters and all attendees are expected to adhere to the conference Code of Conduct. Submit your poster concept before January 13, 2019. 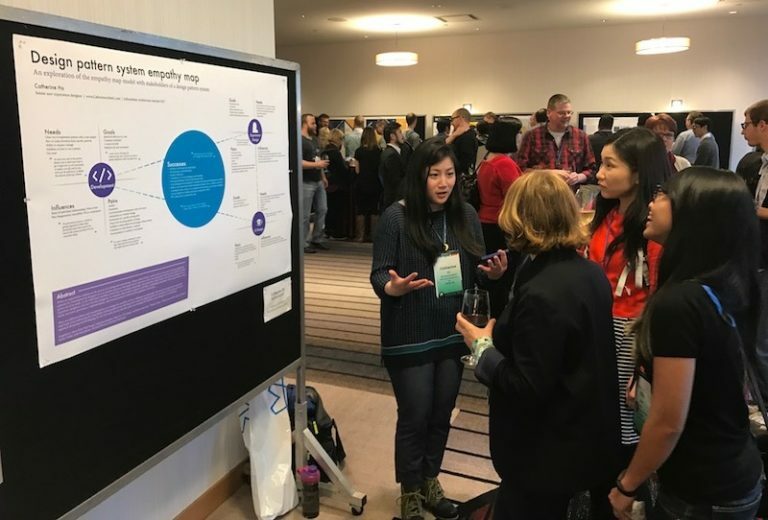 Hallway conversations often rank as the best part of any conference, hands down… Poster Night is like ONE BIG HALLWAY CONVERSATION to which you’re allowed to bring your own visual aid… I highly recommend Poster Night to first-timers and conference veterans alike! I think I love presenting posters more than I like giving presentations. Not only can you test your new topic in a lower-stakes way, but people actually stick around and chat to you about your ideas (and ask great questions); this really helps you hone your pitch. I loved presenting at Poster Night! It was a fun, relaxed environment where I had numerous, insightful conversations and made connections that lasted far beyond the Summit week. New to the IA/UX/tech community? In the midst of a job change that you don’t want to talk about? Have an idea you want to share, but haven’t fully fleshed out? If you answered yes to any or all of these questions, then submit a poster for IA Summit. Do it! Poster Night is the ultimate ice-breaker: a casual, low risk way to chat with dozens of Summiteers whose paths you might not otherwise cross – made even easier because there’s a topic right there in front of you. Getting to present at an international design conference as an academic researcher and teacher was a great professionalization opportunity. I learned a lot more than I gave, but I made connections in the UX world that have impacted my career to this day. The IA Summit Poster Night is a great experience. You get to talk about your own topic with the brightest minds in the industry. It is a great time to sharpen your ideas and get feedback, while making new friends. Poster Night was a great opportunity to showcase work and get immediate feedback, questions and advice from knowledgeable peers. It was a lively evening with large crowds – wonderful to see the range of work and passionate projects going on across the global IA family.